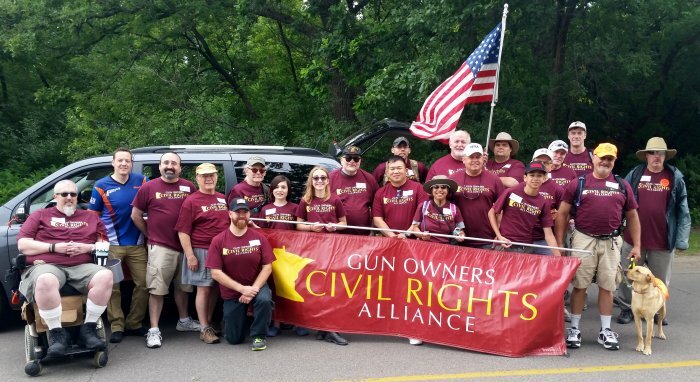 From passing the Minnesota Carry Law to enacting Range Protection, Gun Owners Civil Rights Alliance has fought for Minnesota gun rights since 1989. Our members contribute and participate because they believe that SELF DEFENSE IS A HUMAN RIGHT. We gave away 7100 Tootsie Rolls, talked to hundreds of people, and passed out thousands of info flyers. New to GOCRA? Make sure to sign up for our free email alerts (that also give you a chance to win the occasional gun) at gocra.mn/join. GOCRA is a participant in the Amazon Services LLC Associates Program, an affiliate advertising program designed to provide a means for sites to earn advertising fees by advertising and linking to amazon.com. That means that when you shop through the link below, we get the commission. Bookmark this link, so you can always shop at Amazon with GOCRA! In 2013, they came for your gun rights, and you told them NO! Hundreds of GOCRA supporters filled the hearing rooms, the halls, the overflow room, and the overflow overflow room. The Minnesota Legislature convened just 25 days after the Newtown murders. Anti-rights legislators didn't waste a moment exploiting the tragedy, and introduced almost a dozen gun control bills in the Minnesota House, including universal registration. We flooded the Minnesota State Capitol with civil rights supporters like you, presented expert testimony, and rallied thousand	s of gun owners to contact their representatives and tell them to say NO to infringing our civil rights. 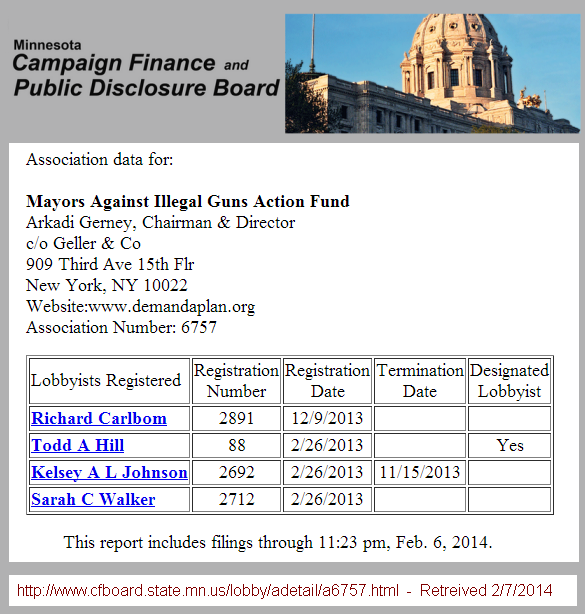 New York dollars, Minnesota shills. Click for full size. New York City multi-billionaire Michael Bloomberg, through his proxy, "Mayors Against Illegal Guns," targeted Minnesota for new gun control. To do so, he bought a team of "activists for hire" in Minnesota, led by Richard Carlbom. Their goal was universal gun registration, which they call "universal background checks." In 2015, we went on the offensive. With your help, we pushed to expand your gun rights, and we passed suppressor legalization, curbed government's emergency powers, removed the Capitol carry felony trap, clarified interstate sales law, and expanded permit reciprocity. Please join GOCRA by signing up for our important action updates, and consider supporting us financially.